GrimmSpeed Hood Struts: Tired of that ugly OEM hood prop blocking your view of that beautiful FA20 boxer engine? Always wanted to open your feather-light hood with just a couple fingers? Annoyed that the hood prop is always in your way while you’re working in your engine bay? GrimmSpeed to the rescue. A close collaboration between FT86Club.com members and GrimmSpeed, this kit delivers in a big way. We hate to use the "P" word, but designing this kit to be perfectly balanced was a requirement. Lift the hood halfway and you'll find a generous neutral zone. Leave your hood here for a sleek look at that local car show. Alternatively, a flick of the wrist is all that's required to coax your hood into its fully opened position. To close, simply hold the hood below its neutral zone and let go. No need to risk scratches or deformation by pushing your hood closed. 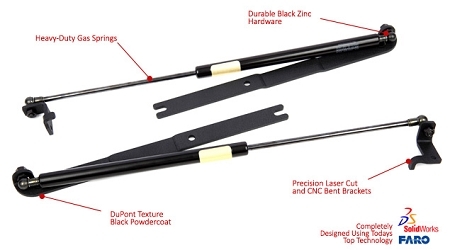 * Premium Quality Struts - Larger strut body for smoother operation, made in the USA!